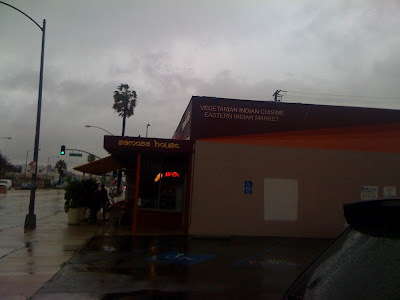 I had read on CH about two competing vegetarian Indian joints in Culver City. The chef from Samosa House went to open up Bawarchi. I diligently read up about the two to see which was better but it seemed that ultimately they were fairly similar. I'm not a vegetarian but I'm fine with consuming only veggies for a meal if it is flavored properly. I flipped a coin and Samosa House was it. Samosa House not only offers cooked food, but is also a convenience store. 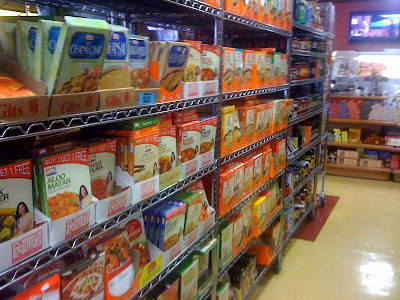 There are rows of various instant curry in a box, snacks and spices. You select food items from the display section and can opt to take-out or consume either at the indoor seating or outside patio. The menu is all vegetarian food and served with recyclable plates and utensils. I decided to order two samosas, the lunch combo and also grabbed a couple boxes of curry and biryani. I was quite disappointed with the service. The guy at the counter was obviously new but he really messed up on a couple of notes. Firstly he forgot to put in my samosa orders. The customer who ordered after me got his samosas after 10 minutes (since they were frying it up fresh) whereupon the cashier looked at me with an "oops" look and went to the kitchen to put my order in. That led to another 10 minute wait. Secondly, when the kitchen handed him some naan wrapped in foil, he asked me if that was mine. I said it would be mine if it was tandoori naan. He put it in my bag. Turns out, it was plain naan, not tandoori. Thirdly, he set the boxes of curry that I wanted to purchase aside and forgot to ring me up for them until I reminded him. Last and most unforgivable, he did charge me for the groceries but never ended up putting them in my bag. I was upset when I got home and found that they were not in the bag. Well, hopefully the food could make up for it. Two orders of Samosa. I liked the filling of the samosa (the usual potato and vegetables) but the samosa tasted like uncooked vegetable oil. In fact, I could only stomach a bite, proceeded to spit it out, attempted again to no avail, then had to trash the rest. Lunch Special for $7.99 which includes three items, rice and naan. Portions are decent and I like that they offer brown rice basmati as an option. Hey, every bit helps! 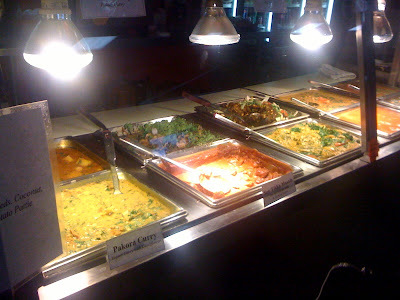 I got the kathal jackfruit, aloo curry potatoes and soy tikka marsala. The food smelt great. I was disappointed with the plain naan instead of the tandoori naan that I had ordered. The soy meat tasted like mock meat and was very chewy. I don't know why they didn't use fresh tofu instead. The jackfruit had an interesting texture and was a bit stringy and chalky. I didn't mind it but I don't think everyone will like it. All the sauces at Samosa house were not very flavorful, were a bit too viscous and had a sour taste. I was very disappointed with the marsala sauce which was made with soy coconut milk and tomato sauce because it's usually rich and flavorful. The only thing I really enjoyed was the basmati rice and potatoes. Is this really what vegetarians are subjected to? You always hear chefs speak about how you can make healthy food delicious if you pack in great flavors. I didn't get that at Samosa House. The food was bland and very mediocre. I have had much better Indian food at the $14 Sunday buffet at Clay Oven in Sherman Oaks (which includes unlimited sparkling wine). Service was horrible and it wasn't even a busy day or during lunch/rush hour. I'm bummed that my groceries never made it into my bag and I had to wait about 20 minutes for samosas, at a "takeout" joint no less. The guy at the counter was obviously new, so I guess I allow him some concession. But the food at Samosa House won't draw me back either. someone (veghead) was just telling me how AWESOME Samosa House was.. blech. How do you call yourself samosa house and then have crappy somosas? wrong. I know Yutjangsah, it's sadness.. I agree with you on this review. I took the hubby & kids here once and the food was disappointing.